I made these to get people's thoughts and opinions (e.g concepts, mechanics, art and etc.) before deciding what direction I want to go in with a more serious project. I've also been doing a lot of practice with pixel art and wanted people's opinions on that as well. I didn't bother adding a download link to either since I assumed no one would be interested in actually playing either prototype. But if for some reason someone is interested in trying the Animal Survival one (the ecosystem sim is not really in a usable state) let me know. *Warning: Some violent, morbid and creepy content in this one. This is not a child friendly game despite the cute kittens. Quote: Mama Kat used to live a peaceful life family: her owner and her owner's other pets. She had everything she needed, and the only thing she had to worry about was her brother and the family dog annoying her. 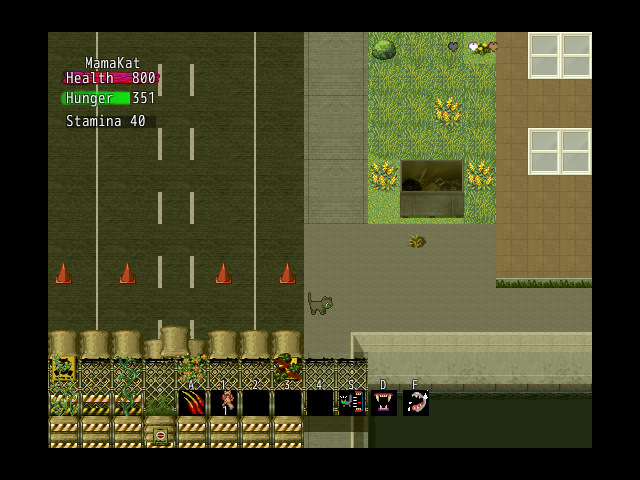 Now the humans are gone and the town pets are either dead or want Mama Kat dead. All that remains of her family are her three young kittens. To keep what's left of her family alive, she must hunt and avoid being hunted. But feral dogs, and a crazy territorial calico, are not the only creatures she has to fear. In absence of man, strange and terrifying beasts have begun to arrive. Some from the cold forests of the north, others from the dark ruins to the south. 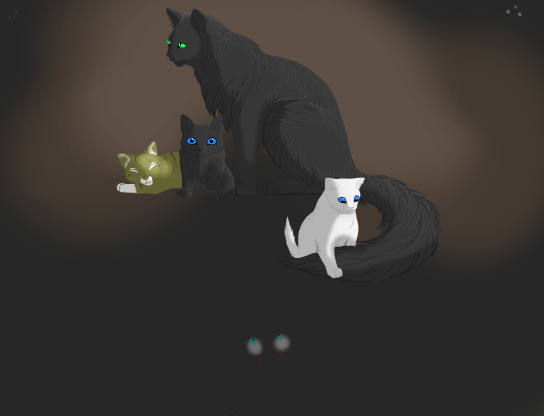 These deadly creatures now fight to claim rulership of this land, with Mama Kat's family caught in between. This is a prototype for a game concept I've wanted to make for a long time: A post apocalyptic open world survival horror game about animals trying to raise families in a savage land where man has left behind ruins... and nightmares. This prototype was made with RPG Maker VX Ace (although I did also use XP assets, I own both. Plus I purchased several dlcs during a steam sale). However, for actual game I'll probably switch to Unity and re purpose the code from the above ecosystem game. The plot of this prototype was taken from a story I originally wanted to write as either a novel or webcomic. Although, I have been considering dropping the plot in favor of a more something more generic and less linear (although I still do want to continue Mama Kat's story somehow in the future). I find making linear storied games, and cutscenes, to be less enjoyable to make than more procedural worlds and stories without cutscenes. However regardless if I keep the story or not, I do intend to add other playable animals. Mama Kat's story basically being the "campaign mode" so to speak. I made a playthrough video series (as well as videos of cutscenes and bonus content). Since the playthrough was kind of long, the spoiler below only has part 1, 4 and 5 (and the extras). They were shorter while showing off more atmosphere and gameplay. The rest of the playthrough series is on my youtube channel and demonstrates other mechanics and atmosphere. 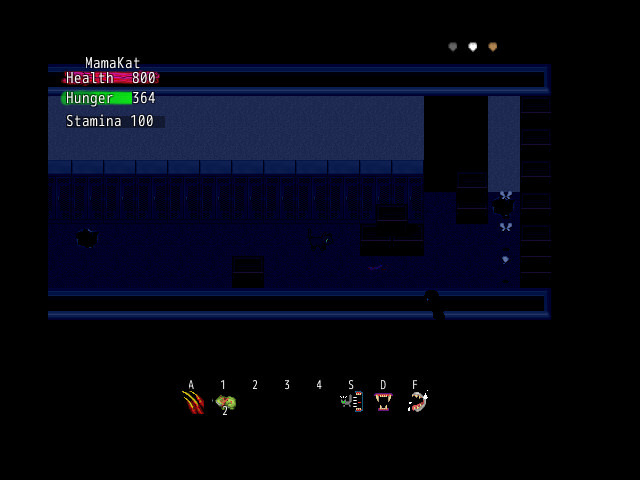 Credits for resources used to make the prototype are in "Cat Story part 7" of the playthrough. Animal combat is more than just smacking each other around till one party dies. In real life predators try to restrain prey while attacking. Prey try to keep enemies at bay (e.g running away, threatening if cornered or striking if caught). So I gave mother cat the ability to grab prey and bite. However caught prey (especially rabbits and rats) will try to strike at her and make her let go. Mother cat can use her claws to keep predators away if she's cornered. Conversely, among rival predators that are evenly matched there's often more display and intimidation than actual combat (aside from biting exposed rears). Although there's no actual npc vs npc group fighting, there are cutscenes and events involving groups of animals fighting. Most came out bad, unrealistic and not how I wanted (I still loathe the cutscene with the grey dog being killed for how unrealistic and corny it came out). But I thought the dogs challenging the creatures over the deer carcass in part 5, and the dog pack surrounding the wolf (part 2 at 2:40) were okay and conveyed what I envisioned in my head. They were both inspired by videos I saw of groups of wild animals fighting (grey wolves vs bears or domestic dogs, african wild dogs vs hyenas, hyenas vs lions). Although I probably should have added more rear biting that was common in those videos. Photomanipulation: When I was younger I played a lot of flash horror, many of which utilized photo-manipulation (especially Exmortis). But I also really loved Omega Flowey from Undertale. So I decided to try photomanipulation for a game myself. The image I used was of uncooked mutton being sold at a market. While I like how it came out, I'm not sure I'll do it again in the future. 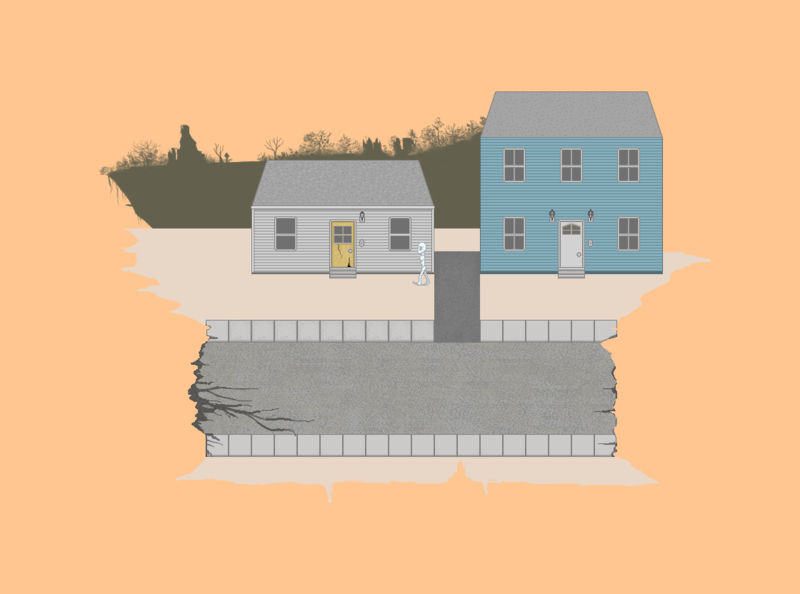 I'm not sure how to utilize photo-manipulation in a 2d overhead game without getting repetitive. Plus, even if I do photo-manip again, I don't think I'll use meat again for a source image for various reasons. Although I probably will no longer work on the ecosystem sim for various reasons (but mostly because I assume animal survival would generate more interest), much of the code and concepts will likely be re-purposed for the animal survival game when/if I switch to Unity. Although the actual tools for modifying to ecosystem will no longer be utilized outside of debugging. But I figured I'd state what this was originally going to be nonetheless and see if people thought any of the concepts could still work in a survival game. In the video above showed some features of a much older version of ecosystem sim I made in Unity (I have much more recent versions with better code, ui, day/night system but this version was the only one with functional AI). Unlike the animal survival one, almost everything here was made by me (but much of it is old and no longer used). Ai that has dynamic interactions. For example, in the video the "Twerbivores" form mated pairs and work together to protect their offspring from predators. Carnivores stalk their prey because if they charge to soon they can run out of stamina and the prey can escape. Later versions of the game (not the one in the video) had pack hunters and creatures were only females engaged in parental care while males would kill offspring to bring females back into heat. Most ecosystem games I've played the only thing that influences populations is death by starvation and predation to "balance the ecosystem. While predation is important, it is not the only factor (plus the way most games have it set up, often predators consume everything and cause their own extinction). Plus death is not often the main cause of population decline when it comes to malnutrition, it's lack of reproductive success. In my ecosystem game, animals can only breed if they have enough nutrition. Evidence suggests that inability to reproduce from malnutrition (or stress) can be just as, if not more, important to animal populations than predation and may be the true source of population cycles. I also had plans for predators to be defend territories and kill rivals so as to limit population density or predators as is the case with many predators IRL. Not in the sim, but I wanted to include diseases and parasites which are also important in controlling animal populations. Complex soil and flora that's more dynamic than is typical in most video games. In most games, plants are only scenery or, at best, intractable objects. In this game, they are just alive as the animals and have their own needs (e.g plants reproduce, require sunlight and moisture but can also die from drowning or overgrazing.) I also had plans for them to have defenses as real plants do, or utilize animals for reproduction (while the plants in the video produce fruit, it doesn't really do anything other than feed herbivores). However based on observations and research, I suspect interest ecosystem management game would not generate as much interest as survival game (and let's be honest, half the comments I see regarding ecosystem games is "I want to play the animal"). But I do plan to retool much of the ecosystem code I wrote into the survival game. Although plants and soil will not be as dynamic as planned, I still want them to be more dynamic than most games. 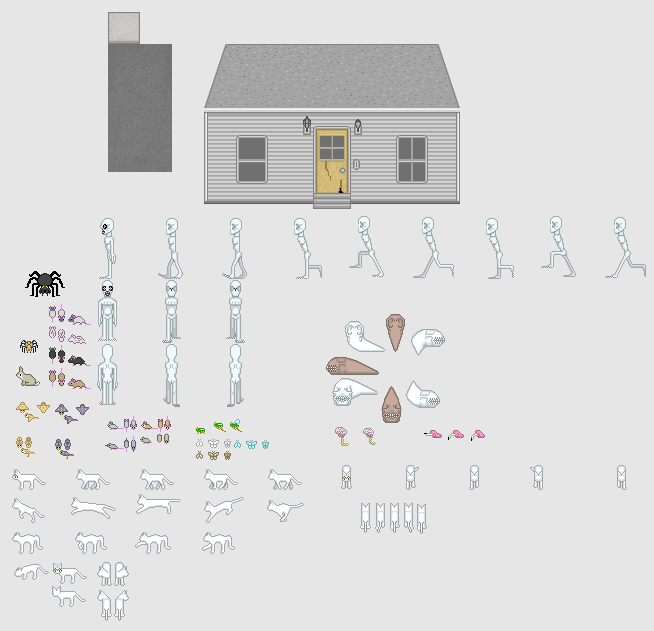 Although the Animal Survival Prototype uses many placeholder assets, I added many of my own sprites (owl, deer, snake, humans and most monsters). Although I did not add any original environmental assets to that prototype, I have been practicing on making pixel buildings and foliage. I would appreciate your thoughts on the sprites I made. 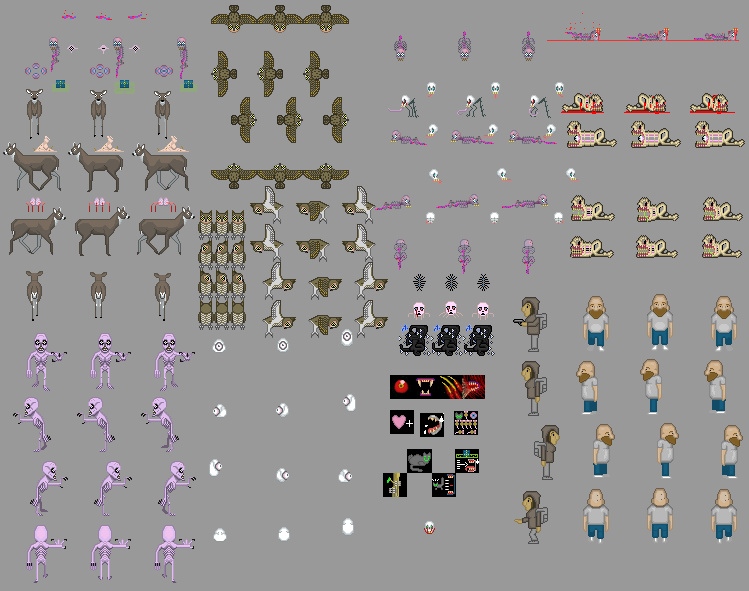 "Original Creatures Sprites in Animal Survival Horror Prototype"
"Original Creature Concept Sprites not used in prototypes"
I've also considered doing fictional animals instead of real ones (this does not include monsters which I intend to be separate from animals). While I imagine people would prefer real species, this would come with many difficulties that would severely limit gameplay and species amount. People (including myself) have much higher expectations for real animals, and making sure the design and gameplay adheres to the real thing can be a challenge (for example, finding specific sound effects for specific kinds of animals can be a difficult, sometimes almost impossible.). The challenge with real animals would also mean the overall species diversity, and gameplay, would be FAR lower than if I did fictional ones. Continue current direction with real animals. It's important to note that this direction would have FAR FEWER species and much more limited gameplay. Fictional species that have fantasy powers (I always toyed with the idea of a game that's based on Steven King's The Mist where people play as the alien creatures). This would probably allow far greater freedom gameplay wise and allow for a much much higher species diversity. 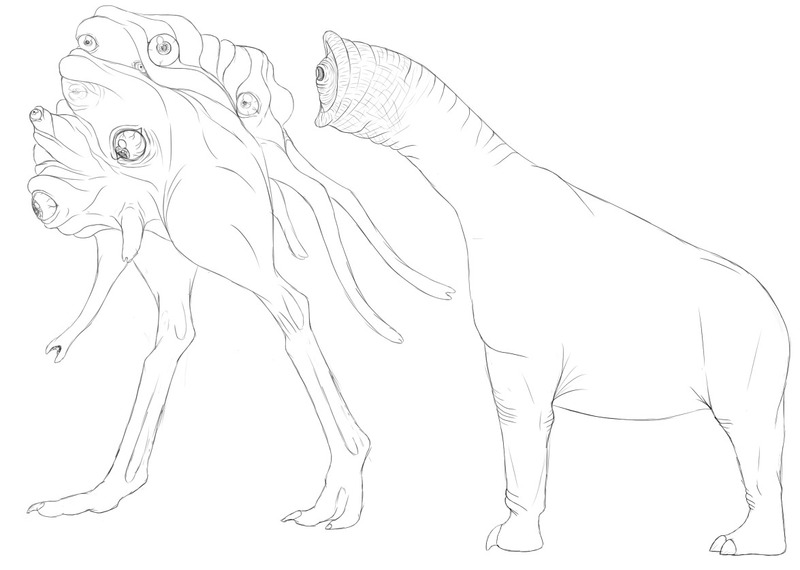 Design influences would be Half Life, Metroid and Wayne Barlowe's Expedition. Something to note is even if I go with more of "The Mist" direction, I'd still probably have small things such as rats and bugs. 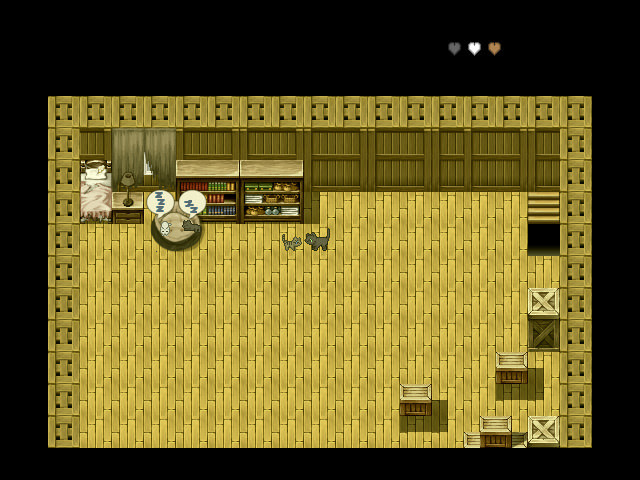 It's also possible for me to continue with mama cat's story. Except instead of an ecosystem of real animals, it's an ecosystem of alien creatures. 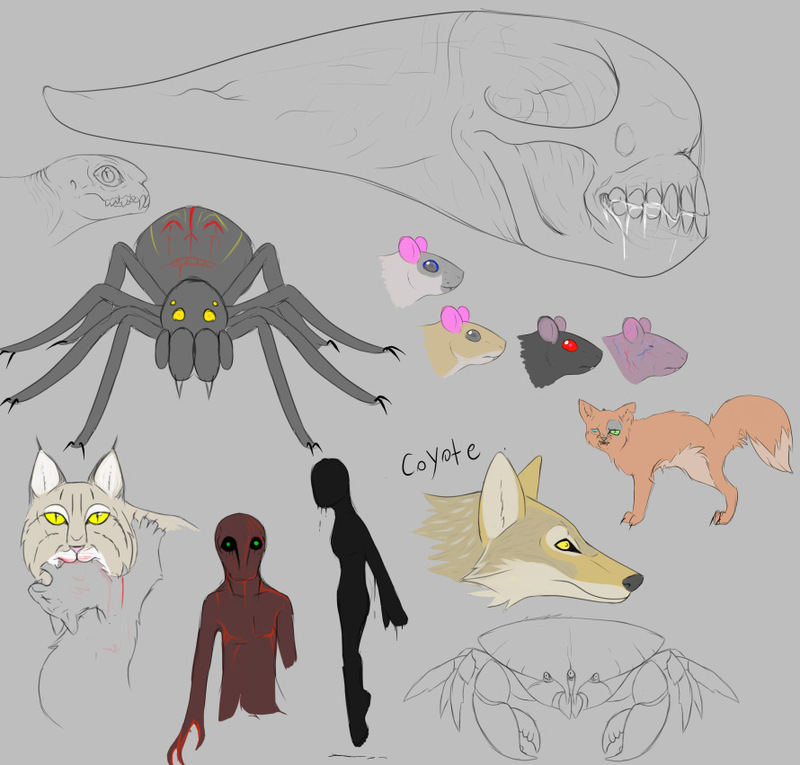 If you want idea of possible ways animal-like creatures would look, my deviantart has various animal and monster designs I've made in the past unrelated to this project. 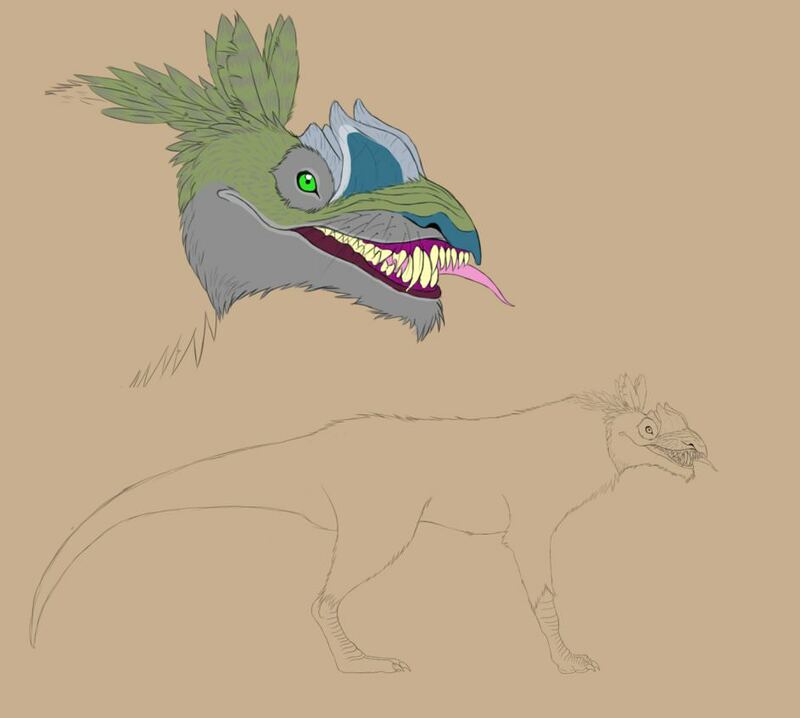 If you want idea of possible ways animal-like creatures would look, my deviantart has various animal and monster designs I've made in the past unrelated to this project. Insofar as choice #3, what if the 'fictional' creatures are just alterations of those in existence? Carnivorous deer for example? Flesh eating horses now that man has left them behind or worse? Mama Cat might have some issues with rats now that they're as big as dogs. Raccoons are not exactly idiots, but problem solvers. THEY can be the hunters she truly fears, if not the large birds of prey and the like. Protecting her young against animals with problem-solving intelligence can be terrifying. (09-06-2018, 04:24 AM)DerVVulfman Wrote: Insofar as choice #3, what if the 'fictional' creatures are just alterations of those in existence? Carnivorous deer for example? Flesh eating horses now that man has left them behind or worse? Mama Cat might have some issues with rats now that they're as big as dogs. 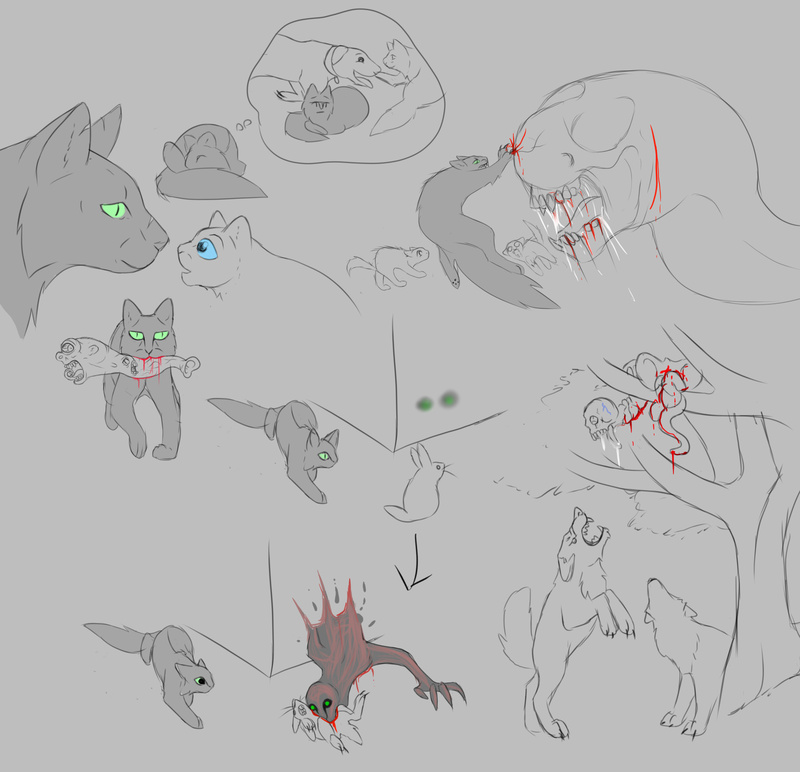 This general direction of "mutated" animals I have considered (and in the prototype Mama Cat can actually gain special abilities by touching certain objects or eating some of the tiny monsters). Although if I were to go with that, then I don't want mutated animals to be overly numerous (except maybe giant bugs) like how in The Isle mutated dinosaurs are much rarer than normal ones. Or I could have them so changed they no longer resemble the animal type they came from nor interact/breed with their ancestral species. Basically having become an entire new species all together. There's several reasons for this, but the most important is because if I am going to include real animals then I don't want them to be overshadowed by the mutated ones. Also, regarding birds of prey, the prototype has owls. 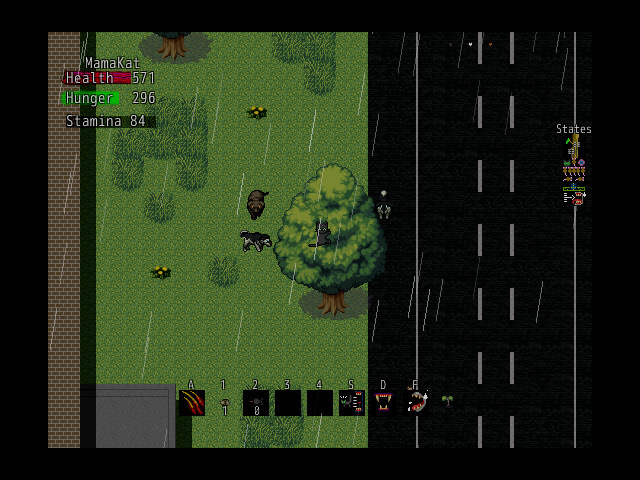 They only attack if the player gets too close, but since they sit in trees they're not always easy to spot. You forgot about windows, cats love them! Just go ask Patches or Evil, they will confirm it! What about alien species being the root cause of humans vanishing from Earth? For there to be alternate 'mutated' species while MamaCat and her kin remain untouched might be related to a few things. One: cats might be naturally immune to whatever MIGHT have caused this sudden change in genetics. Two: these cats, the pets, might not only be domesticated but pure by design. That is to say, raised by humans that way. The Calico (which you now have ^_^) might have been a pet that has now become feral. Three: Whatever happened, MAN did it years ago ala THE MIST, but on a more subtle note to our own environment rather than bringing in another. Could be a good backstory or something for filler. Oh, you got other birds of prey out there. Hawks, falcons, eagles, evil Fanged VampireDucks that have speech impediments. (09-07-2018, 01:54 AM)kyonides Wrote: You forgot about windows, cats love them! Just go ask Patches or Evil, they will confirm it! (09-07-2018, 03:25 AM)DerVVulfman Wrote: For there to be alternate 'mutated' species while MamaCat and her kin remain untouched might be related to a few things. One: cats might be naturally immune to whatever MIGHT have caused this sudden change in genetics. Two: these cats, the pets, might not only be domesticated but pure by design. That is to say, raised by humans that way. The Calico (which you now have ^_^) might have been a pet that has now become feral. Three: Whatever happened, MAN did it years ago ala THE MIST, but on a more subtle note to our own environment rather than bringing in another. As far as plot goes, I don't intend to add an actual answer for why people are gone and the world is different. Aside from adding to the mystery and leaving it open to interpretation, this emphasizes that the animals have no way of understanding what happened or why things suddenly changed. I also think it adds to the feeling that the player is only a minor and unimportant background element to a much bigger story that's beyond their control. This obscurity will also apply to the origins of monsters or creatures that look like they're derived from animals. However I can say that humans have only been gone for about a year (the litter in the game is mama's first) and humans still exist but are incredibly rare. Although I intend to leave ambiguous if that rarity is global (near extinction) or regional (e.g if they're only rare in the area due to it now being either dangerous or inaccessible.) It's also ambiguous if the change happened suddenly in the town she lives in, or if it started elsewhere awhile ago and eventually grew large enough to impact the town mama lived in. My question and survey was more in regards to issues with design and gameplay. Real animals are very hard to design (especially with how detailed I want the sprites to be and how picky I am with sound effects matching what animal actually sounds like) and are more limited in gameplay. This would mean less variety which I imagine wouldn't be very popular. However people are already familiar with, and often attached to, real animals and would be more likely to consider this project if it had creatures they already had interest in. Plus not having real animals would lessen the impact of many of the themes I had set up. So far, from what I've gathered from people's interest, real animals are probably going to be a certainty. But I still want to wait a bit before deciding about fictional animals. Great Horned Owls are the only raptors in the prototype, but diurnal raptors such as eagles or hawks are likely to be added to the actual game (and thanks for the calico). Also interesting idea of using open or cracked windows to enter buildings, I'll keep it in mind. 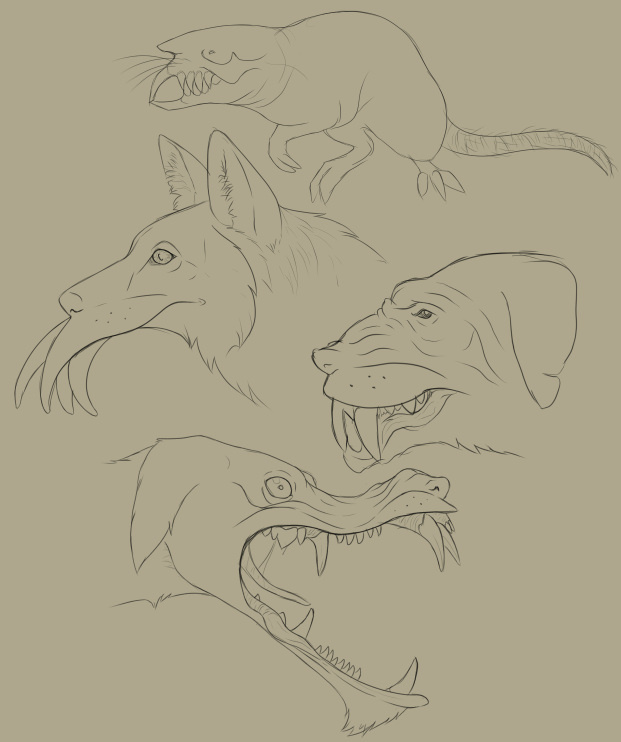 Although these images are mostly not related game, they do give a general idea of how I draw fictional animals. 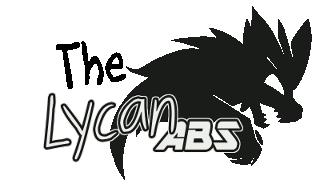 For this I've been working on the sprites. 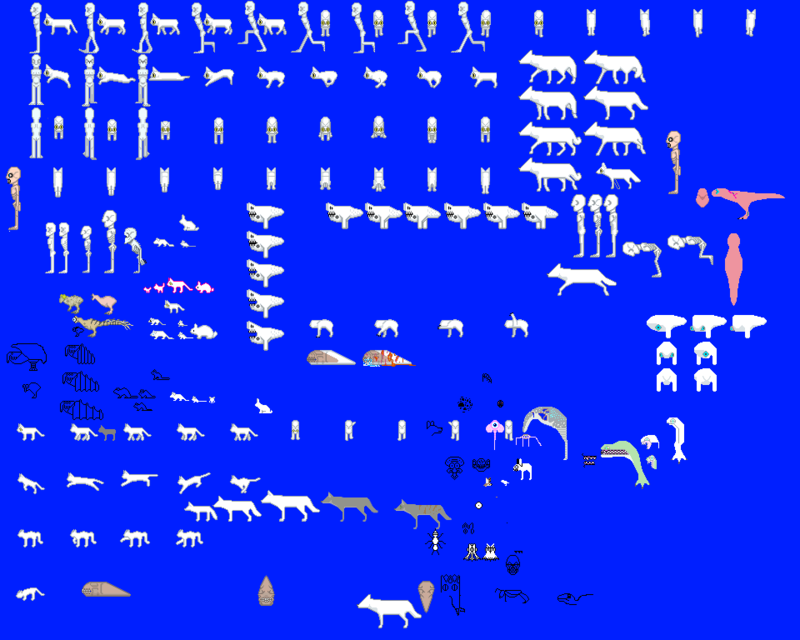 In the prototype all the environmental sprites were either RTP or purchased, while most of the animals were modified RTP. For the proper game I want to have my own sprites, including remaking the animals from the game. However I've also begun making new kinds of creatures. Some new prey I've been working on include grasshoppers and shrews (they'll function similar to mice but their vision and meat isn't as good). 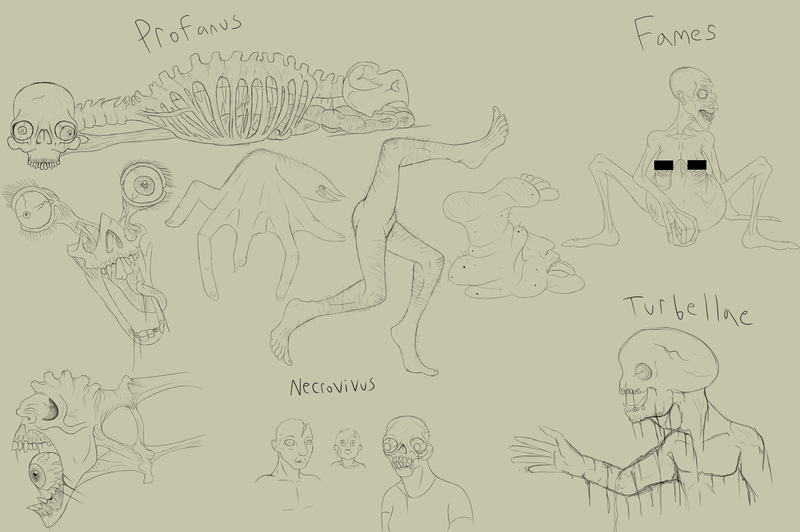 I also have new enemies as well, such as freakish worm creatures (inspired heavily by silent hill). And what's a horror game without some giant crawliers, such as an oversized spider. They comes in two variants: smaller males and much larger female. Males probably aren't too dangerous to the player, in fact they are prey to cats. The females however are deadly enemies to be feared.